WASHINGTON — JACL submitted written testimony Wednesday to the Senate Judiciary Subcommittee on the Constitution, Civil Rights and Human Rights at a hearing on hate crimes and the threat of domestic extremism. 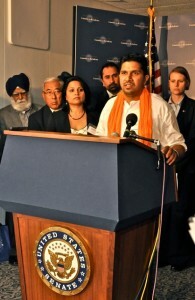 Amar Deep Kaleka, son of the late Oak Creek Sikh Temple President Satwant Singh Kaleka, speaks at a press conference following the hearing. Representing JACL was Floyd Mori (second from left). The hearing was spurred, in part, by the recent tragedy in Oak Creek, Wis., where a gunman with ties to a white supremacist organization killed six people at the Sikh Temple of Wisconsin. The hearing, chaired by Sen. Richard Durbin (D-Ill.), examined the impact of a recent spate of hate crimes and the implementation of the Matthew Shepard and James Byrd Jr. Hate Crimes Prevention Act. JACL’s testimony covered a range of issues related to hate crimes and manner in which domestic extremism has affected the Asian American community. The testimony chronicled historic examples such as the Chinese massacre of 1871 in Los Angeles, where a mob stormed Chinatown, shooting and lynching innocent Chinese residents. The testimony also described a 1999 shooting spree where Benjamin Smith, a member of the known hate group World Church of the Creator, killed Won-Joon Yoon, a Korean graduate student, after first killing an African American and firing at Orthodox Jews as they were returning from Sabbath services on Chicago’s northside. Ouchida further stated that JACL will continue to monitor and respond to hate violence because it is an important component of the organization’s mission. In its testimony, JACL offered wide-ranging recommendations that addressed underreporting of hate crimes, the need to improve police training to include cultural competence, and the need for colleges and universities to adopt clear procedures for responding to hate crimes and hate incidents. Amardeep Singh Kaleka’s father is a hero and a legend!